Sen. Feinstein: 'Total Review' Of NSA Activities Needed : The Two-Way The chairman of the Senate Intelligence Committee says short of hostilities or an "emergency need" for surveillance, the U.S. shouldn't be spying on foreign leaders. 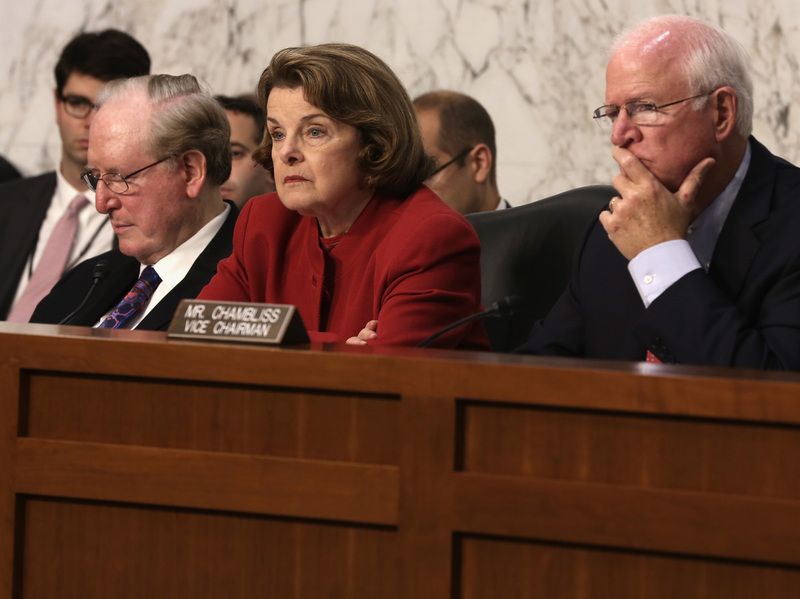 Senate Intelligence Committee Chairman Dianne Feinstein during a hearing in September on Capitol Hill. Dianne Feinstein, the Democratic chairman of the Senate Intelligence Committee, is calling for a "total review" of spying operations directed against foreign leaders. "Unless the United States is engaged in hostilities against a country or there is an emergency need for this type of surveillance, I do not believe the United States should be collecting phone calls or emails of friendly presidents and prime ministers," Feinstein said in a statement following reports that the National Security Agency had eavesdropped on German Chancellor Angela Merkel's cellphone and spied on other leaders. "It is abundantly clear that a total review of all intelligence programs is necessary so that members of the Senate Intelligence Committee are fully informed as to what is actually being carried out by the intelligence community," Feinstein said. "The White House has informed me that collection on our allies will not continue, which I support," she said. "But as far as I'm concerned, Congress needs to know exactly what our intelligence community is doing." "Feinstein has been one of the NSA's staunchest congressional defenders amid the uproar over its phone records surveillance, but she said that the spying on foreign leaders without President Obama's knowledge was a 'big problem.' "
In a briefing on Monday, when asked about the alleged spying, White House Press Secretary Jay Carney said "reviews are underway." "And we are, as part of that process, endeavoring to make available more information about what the NSA does and about the programs that have been discussed a lot of late," he said.